dis·cuss (di-ˈskəs), v.t. [ME. Discussen, to examine, scatter < L. discussus, pp. of discutire, to strike asunder, shake apart, scatter < dis-, apart + quatare, to shake, beat], 1. to talk or write about; take up in conversation or in a discourse; consider and argue the pros and cons of. 2. [Colloq.] to eat or drink (something) with enjoyment. SYN.—discuss implies a talking about something in a deliberative fashion, with varying opinions offered constructively and, usually, amicably, so as to settle an issue, decide on a course of action, etc. ; argue implies the citing of reasons or evidence to support or refute an assertion, belief, proposition, etc. ; debate implies a formal argument, usually on public questions, in contests between opposing groups; dispute implies argument in which there is a clash of opposing opinions, often presented in an angry or heated manner. This second Sunday, the dictionary project‘s flash fiction february features a flash fiction story by writer César Díaz. Enjoy! 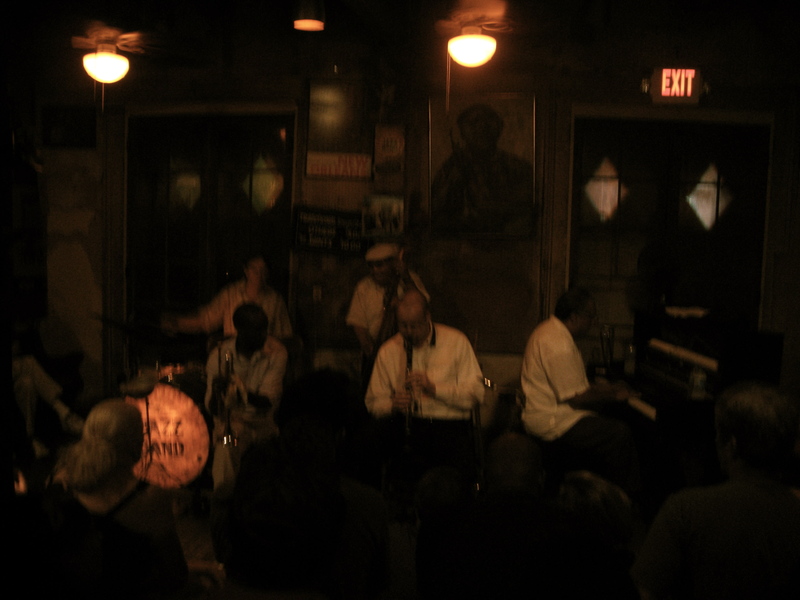 Life of vagrant alleys, of pool halls and restaurants, and whiskey n’ beer taverns soak into the walls of Preservation Hall and sets them throbbing to jazz. At night, these doors open to people who come in stamping feet and nodding. Road shows torch songs that meld into the swollen hearts of lovers of bebop, of blues, of hot jazz. 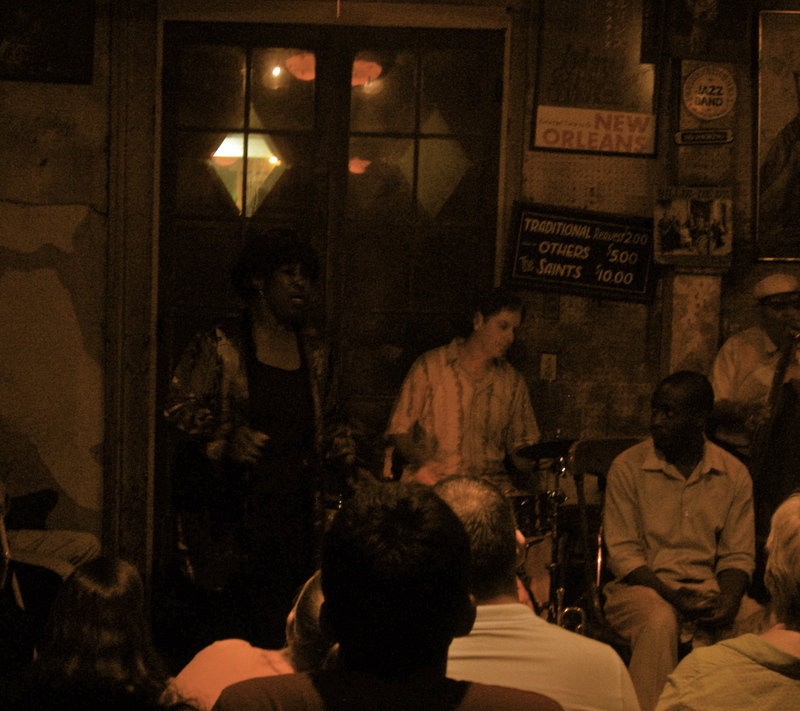 These songs sop the walls; seep out towards the life of New Orleans alley rats and barflies. During the afternoons, these houses are dark; the walls sleep before the musicians plug in, before the singer rehearses. Or until Hayward comes within them, that’s when the walls pulse and the shadowed air grows luminous. Hayward is the owner’s brother. He is seated at the back by the bar, watching the stage just before rehearsal. Light traces down upon him from the ceiling. Half of his face is a balmy orange, the other in shadow. A dim glow of the club rushes to and Hayward’s mind wonders. He asks the bartender for whiskey. Stage lights are soft focus, as if they shine through fingertips. Beneath them, hid only by a mere shadow of a set, is Marian. She sings without piano, without ensemble. Hayward begins to feel as if his body was an audience listening and singing, and snapping fingers, swaying heads, eyes closed, all smiles. He singles Marian out. The pianist’s hand slips onto the keyboards, improvises. The walls awaken. The pianist’s arms, limbs, fingers—fiddling and shifting and lifting. In the air, on the floor, fills the rhythm of the music. Hayward to Marian in thought: Soon the pianist will herd you, tame you, darlin’. Blunt your sharp pith into soft gestures. Soon the audience will see you, call you beautiful. Marian croons, intones. The pianist follows suit in snatches and jazz turns. Voice and strings, spare with loose passion, whelm the room. It stops, and the music retracts. The walls again are off. The stage once again, silent. Men clap. Hayward: She whom I’d love. I’d leave before she knew that I was with her. Hayward’s blood presses in. He wills his thoughts, gulps his whiskey to rid his mind of this lust. “Missus Blake, wonderful! Bravo!” says the hall’s manager. He wants the rehearsal done with. He wants quiet before the men and women from as far away as Mandeville on the north shore of Lake Pontchartrain come and dine, drink, and dance up and down the Quarter. He’s noticed Hayward’s songstress. He watches her. He wants her, and Hayward observes the hall’s manager from the bar. Marian lines up, the piano next to her. She snaps her fingers—music starts. This time a saxophone. Its sound carries and flows where it will not strain Marian’s throat. Marian allows herself to carry, to flow. Her lips are curiously full, and very red. Her legs in thin tan stockings make her lovely. Hayward: Oh, stage-bird. Music girl. Lil’ stuck-up West Coast jazz girl. You’re all up there. Murmur your music, paint the walls in sounds. Bartender, more whiskey! Another music break. Marian sees Hayward. She knows he’s been looking at her. She’s been watching too, off and on. She plays coy. “The owner’s brother,” says the pianist. The pianist stares at Marian. He notices her glances, how she tilts her head, her dark brown locks wave over her bare shoulders. She moves for Hayward around the stage until she sees she has him. Then she withdraws proudly. Marian: Oh, hun, I know respectable folks, lotta of ‘em. New York to Chicago to Philadelphia. I’ve had better men. Doctors and lawyers. Not the hall’s owner’s brother. My. A haughty laugh, a smile and glance back at Hayward. His eyes are fixed. He waits for her to fly, paint the walls with her sound. Her bare shoulders coaxing, her thighs firm against her purple dress. Hayward: I bet she can… I got my place close by. Gotta get her right. Keep her loveliness. “He loves you, darlin’ just look at his gaze,” the pianist says. She swings to the front of the piano. She leans a bit, her brown hair revealing her bare back. Marian feels his eyes. She moves for Hayward. Her back towards him but projected. The pianist again strokes his keys. Music starts, again. Hayward’s head bobs. The saxophonist plays his notes softly. A fluttering butterfly. Taunting. Undulating. O’ just a little more. Hayward asks for another shot. Marian to Hayward in thought: I bet you can’t love. You’re too skinny. Like making love to paperclips. Your lips are slight. You couldn’t love me anyways. But I could get dinner or a gift, a dress out of you anyways. Men like you will marry if you love. Would you love me? Give me kids, a home, everything? Oh, you will. If I make you. Just watch, hun. Marian sings. For a moment, she forgets her tricks. She forgets Hayward off in the distance, drunk by the bar. She bellows glorious notes like muscular limbs. Her croons like sugar heartaches. The walls press in, she is in control. The wall come alive, a flesh-throbbing body that for a split moment pushes Hayward and Marion together. His heart against his mind. They’re at Preservation Hall. It’s as if Hayward knows nothing of it. Only that Marian is its walls. They are singing walls, tender lights throbbing, bobbing, and pushing inward. On Hayward. It is how he feels. It is the whiskey and not his instincts. He has lost his faculties. Hayward enraptured. Marian, his butterfly. The pianist crashes a chord. Her walls collapse. The light above him is no longer. Marion turns and seeks his face, his eyes and they are not there, but shadow. She looks one way, then the other. Pulls her hair, sways her hips. But it’s no longer the same. Hayward’s eyes are not there. His mind gone elsewhere. He has made a decision. She is not for him. “Missus Blake? Missus, are you okay?” asks the pianist. Her eyes flood with tears, she stares at the ceiling lights no longer shedding the light towards the bar. On Hayward. Hayward is gone. He has let her go. 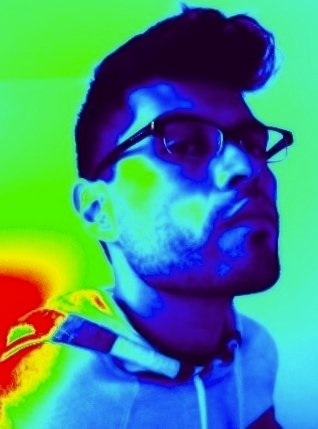 César Díaz is a writer living in Austin, Texas. He is a recent graduate of the nonfiction program at the University of Arizona in Tucson. He’s working on his first book. He can be reached at diaz.cesar at gmail dot com. When I received my word, I immediately jotted down keywords that rang out to me, words that elicited an emotional and visual response. These words from the Latin root meaning of ‘discuss’: to “examine, scatter, strike asunder, shake apart,” got me thinking about an idea for a story where two characters interact without ever speaking a word with one another. I’m fascinated by the way we “talk” through body language, eye contact, and what I think is pure human instinct. In my story, I wanted for Hayward and Marian to have an entire discourse with one another, a back and forth argument where one tries to figure out the other, and in doing so a decision or course of action is made by the story’s end. I wanted my story to have a very “hot jazz'” feel to it, where the language, the tone, and delivery of the story becomes the lens by which the reader examines this interaction between Hayward and Marian. I wanted the reader to feel the jazz club, to see how the walls throbbed and came alive with the music, while also gently lulling the reader into an imagined space before dropping them back in reality. All in all, my word inspired the creation of a lyrical story, a sort of verbal minstrelsy that mimics what Marian does to Hayward: moves around the stage to attract your attention before withdrawing proudly.